After the twins were born, many things in our household slowed to a crawl. Everything from making dinner to going to the store became a task of monumental effort. There was not a moment of regret, just the instinct of survival. In that time, we had many amazing and generous people involved in our lives. Some gave of their time, some gave financial support, and others gave stuff. Cool stuff, fun stuff, stuff for the kids, stuff for the grownups, stuff to feed us, stuff to entertain, loads and loads of stuff. Then there was all that stuff that comes naturally from having children in the house…lots of kids, lots of stuff. Ordinarily, I would have been able to process the stuff and clear and edit as we used it up. However, with four very young kids, it was all I could do to keep the house looking decent, (just don’t check for dust! ), get food on the table and make sure they are healthy and happy. As a result, we ended up with a lot more stuff than we had space for and much of our space was a bit overwhelmed. The garage was in serious trouble. Every time poor Tony had a fun woodworking project to do, it took him about an hour to clear the work space so he could use his saws. My sewing area, used somewhat sporadically during those first two years, was filled to the brim with fabrics, projects and mending. my major project, aside from homeschooling, became somehow getting control of the clutter. It was a goal, a frustration and a constant task. Each time I cleared one area, the sense of relief was overshadowed by the renewed awareness of how much it would take to get the next area done. Yet still, I struggled on, plugging away whenever a free hour came about. About 6 months into this process, I realized it would take me many many many months to really get everything done that needed to be done and the garage…well, let’s just say that the enormity of the task gave me pause. Fast forward to the aftermath of the amazing gift from my amazing family and friends. While Vanessa quietly coordinated monitary collections, Tony and I interviewed and discussed the merits of several organization companies. The first one we interviewed was my favorite by far, and of course, the most expensive. They listened to me, recognized my need and were willing to go the extra mile to accommodate our own brand of quirkiness. 🙂 When they called back a couple weeks after submitting their estimate, we had already decided to go with free family garage organizers. However, they were totally willing to come back and submit another estimate for just the sewing and computer areas, and work with me on the time so we could actually afford it. In the meantime, my brother Aaron and his lovely wife, Nadine, who have had a bit of experience in the garage organization process, agreed to come and spend a weekend with us to clear and reorganize the biggest task. They were phenomenal! We spent two days, from morning to night, purging, cleaning and grouping. 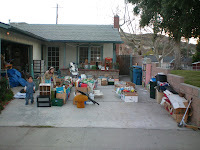 By the time we were done, we had “gotten rid of” several hundreds of dollars worth of school supplies that I no longer needed, as well as much baby stuff, games, etc. Most of it ended up being donated to a preschool that had just lost it’s funding. That made me happy! Admittedly, it took another week to actually get everything out of the driveway, but once the purging had happened, it was just a matter of time. Inside the garage it was like a whole new world had opened up! Suddenly, there was so much space! 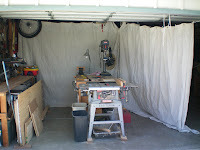 There is a removable curtain for Tony’s shop, (to keep the sawdust off of everything else in the room!). 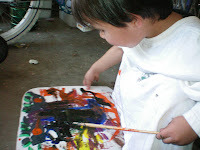 We could park all the kids’ bike type vehicles within their reach and still have room to set up paints and do projects! While this took an amazing amount of time and effort, (and lots of familial support for kids and food!) financially, this was the smallest part of the process. The next step came with the professionals. We decided, after much deliberation, to hire the first people we interviewed, Operation Organization. They have a stellar reputation in LA and agreed to work within our budget to get as much done as they could. looked like paper or crafty stuff. The computer, old and full of viruses, was almost never used. We have laptops that are the daily work zones and they wouldn’t fit in here anyway. Katrina, the owner of the company, came in with a small work crew and lots of energy. They worked for 4 hours the first day and 4 hours the next. She shopped for everything we needed to make the space usable. We donated several piles of things and threw out 4 bags of papers, shredding (burning) an additional 3 boxes. It was glorious! Here come the afters! I LOVE the drawer!So much fits and it is all easily accessible! This was where the sewing area was in my bedroom. Now that it is where the computer used to be, I have room for an elliptical machine with a built in shelf so I can watch shows on the computer while I work out! The computer and sewing table ended up in Adriel and Ramiah’s room, (with no internet), so they could learn how to use a computer without close supervision. Of course, this also is a great motivator to keep their room clean! They even set up a new filing system that can go easily from the house to the garage and holds all the important and immediate paper needs. All of the fabric is now hidden in the living room boxes and cabinets and all of the toys that once lived in those places are relegated to the appropriate bedrooms, hopefully rarely seen by us grownups! So family and friends, I hope that you can see that your gift was well spent and has literally changed our lives. There is something of a peace that comes when the mess, even hidden, is gone from your life. I’m sure this is a great metaphor but for now, I’ll just leave it, knowing that whatever your motivation, you have been a part of a revitalizing and joyful renovation that would have otherwise taken me months to achieve. And we are so so grateful. All you needed was a little push and look what happened!! I’m so impressed. I wish I had a crew of people to come help me get organized and caught up. It seems w/ 4 young children the work is endless and a bit overwhelming…I mean, who has TIME to do anything productive? We have been living in our new home for a month now and STILL haven't found the time to unpack EVERYTHING!! Congrats & good luck keeping it maintained!